The look is contemporary, the demeanor stately. The new Masterpiece Lune Rétrograde introduces a new interface that is unique in its kind and that offers time measurement a generous case with a 46 mm diameter. Driven by the new Manufacture-made ML 152 movement, this timepiece is imbued with a geometric simplicity that galvanizes its mechanical complexity. Like time itself, it displays a dynamic personality that is constantly on the move together with a high-tech, openwork dial. Beneath the sapphire crystal, which has an anti-reflective coating on both sides, the dial structures and gives proportion to the watch’s time indicators with calculated and mathematical balance. Perfectly symmetrical, the power reserve and retrograde date displays, positioned at 2 o’clock and at 10 o’clock, are mirror images of each other. The meticulous, hollowed-out windows offer a subtle behind-the-scenes glimpse of time; the arcs have been skeletonized for an “industrial” look, while all unnecessary decor has been avoided. Featuring boldly colored extremities, each hand has been delicately applied to the dial and slides beneath one of the numerous hollowed-out arcs that display the watch’s information. The moon phase is displayed on a precisely calibrated celestial disc positioned at 6 o’clock. This design fulfills the brand's desire to give time a more modern image. A small luminescent hand, that closely resembles the hours and minutes hands, indicates the day of the week on the edge of the moon-phase disc. 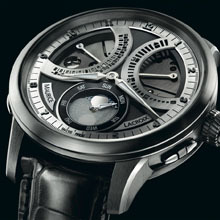 The technical nature of the Masterpiece Lune Retrograde extends to its simple finishes. Its dynamic, calculated and steadfast design resembles those who have decided to appreciate time with determination and confidence, rather than suffer it. A worthy heir of the brand’s heritage in terms of retrograde and moon-phase mechanisms, this model joins the ranks of the ML 150 and ML 151 movements launched in 2008, which were also designed and developed in-house. Movement: Moon Phases Retrograde Calendar Maurice Lacroix Manufacture movement ML152, equipped with its own lever assortment, gear-train and spring balance, developed, manufactured and assembled in-house. Functions: Hours and minutes indicated by central hands, retrograde calendar indicated by hand, visible through the dial at 10 o’clock, moon phases indicated by a disc at 6 o’clock, day indicated by a hand at 6 o’clock, power reserve indicated by hand, visible through the dial at 2 o’clock, vibration 18,000 vph, 2.5 Hz, power reserve 42 hours, 37 jewels, adjustment: 5 positions when fully wound and after 24 hours. Decoration: Hand-decorated bridges plated with black-gold and featuring large snail-like pattern and dedicated moon phases disc. 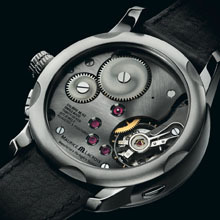 Case: Combination of polished sunray, circular- and vertical-brushed surfaces, steel, 46 mm diameter, screwed steel bezel, domed sapphire crystal with anti-reflective coating on both sides, integrated shaped push-pieces to correct functions, screw-down crown in ¼ turn, screwed case-back featuring a large sapphire crystal with anti-reflective coating, water resistant to 100 m / 10 atm. 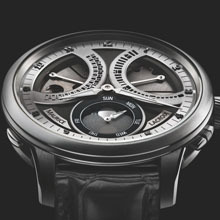 Dial: Functions revealed through skeletonized dial, main plate: slate-gray with vertical-brushed finish, skeletonized retrograde calendar and power reserve zones, applied ring: circular-brushed with polished applied slate-gray Arabic numerals, integrated skeletonized indicators for the retrograde calendar and power reserve functions, large opening at 6 o’clock for the moon phase indication, with an integrated metal-coated sapphire crystal, applied “Maurice Lacroix” brushed cartouches. Strap: Black hand-stitched porosus crocodile-skin strap with large scales, black calfskin lining and matching stitching. Edition: Limited to 250 pieces, with certificate.